Cassandra Torda and Angela Ng are UX/UI designers at Egnyte. They work alongside a small team of UX/UI designers to help create a whole lot of product. Not unlike many small design teams, they found themselves wanting to do more research throughout their product development cycle, to ultimately build better products faster. And if it was going to get done, they’d be the ones to do it—no full-time researchers to lean on. To make research a habit, they also needed to do it fast, on a budget, and actually get some value out of it. With the goal of becoming more research driven in mind, the team set to work designing lean research studies. They relied on internal teams less familiar with the product as participants to start, but it didn’t take long to realize they’d get better insights from more specific participants, like their target customer. So they did what any scrappy designer-turned-researcher would do and turned to Craigslist. It wasn’t a terrible experience, but it took a lot of time—time that could have been spent refining research scripts and prototypes to create better usability testing sessions. After a few months of this type of external user recruitment, they started to realize how similar their participants were to each other and how they didn’t mirror the diversity they had in their customer base. Around this time, they may have also gotten booted from a Starbucks or two, recruiting local patrons and running guerilla usability tests amid a background of Pumpkin Spice Lattes and hopeful entrepreneurs. Trying to recruit participants in other establishments was ineffective because people were not receptive in these settings. “There were some crazy times back then,” Angela shared. They were impressed. User Interviews “tackles the issue that most business have with user research.” And for them, recruiting was the biggest hurdle. Once they started using User Interviews on a regular basis, they were able to do more research faster. A sample interview script from Egnyte. They ask some observational questions first to get to know the user. Then provide a scenario and introduce the mindset they want them to get in. Finally they have the user go through the prototype, asking questions along the way. They’re able to find professionals by industry, location, demographic, technographics, or any custom criteria they need fast. They ended up being less biased in user recruitment since User Interviews has a much broader reach than they do. This led to more objective user research and high quality design iterations rooted in usability research. 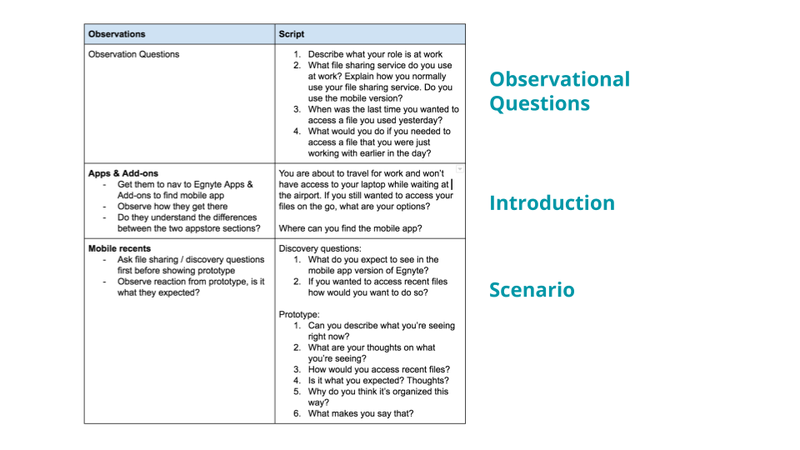 To date Egnyte has conducted over 20 studies with User Interviews, helping research to truly become a habit and ingrained step throughout their product development cycle. 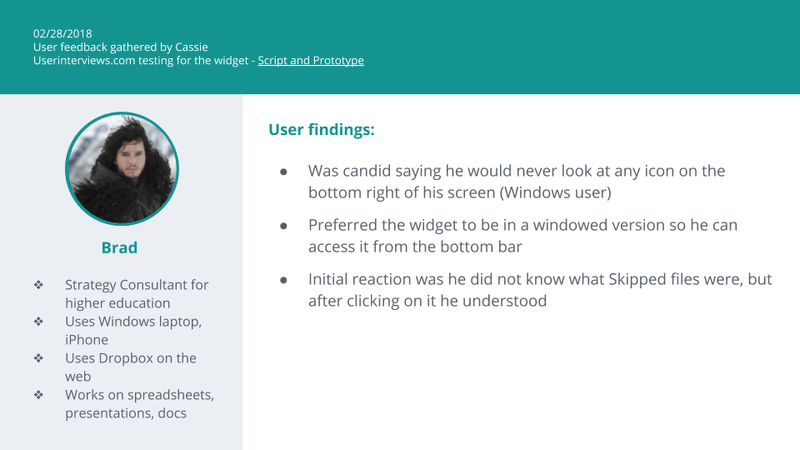 Sample findings from a usability testing session. They’re now doing more remote usability tests, which helps them get a greater diversity of participants faster, but still gain the insights they need. They find the more research they do, the more it builds on itself, so that they need to do less discovery research for similar products, and can spend more time on usability studies for their completely new feature sets. Since User Interviews is completely method agnostic, it’s easy to use it according to your changing needs. A sample presentation of their research findings after performing a usability test. 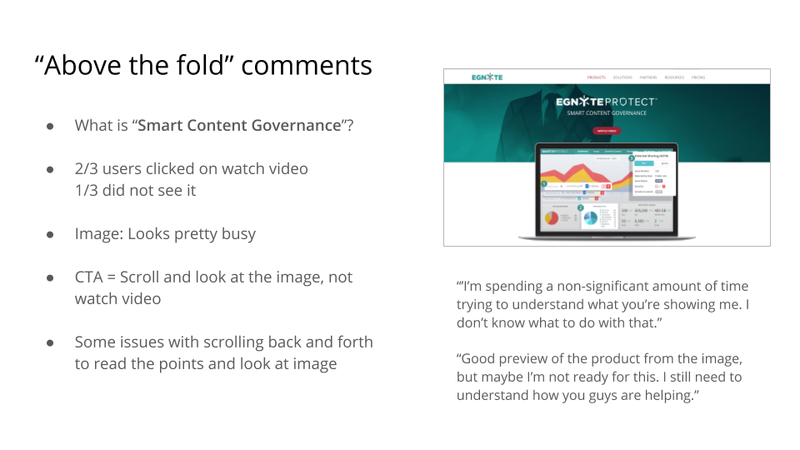 They show it to stakeholders, so they can better understand what the insights from usability testing. Ultimately, Angela, Cassandra, and team are now building better products faster with a sense of confidence that they’re building what users really want. Learn more about, Recruit, the product that made this story possible. Make your own story. Start talking to users today.